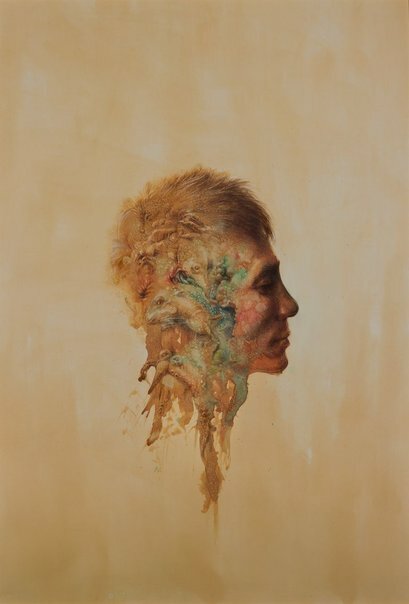 Khue Nguyen’s self-portrait expresses the complex and difficult emotional journey he has travelled to arrive at the relatively happy place he finds himself today. Born in communist Vietnam into an artistic but excessively strict family, he was never able to admit openly that he was gay. ‘It has taken me a long time to reach the stage where I can say: ‘this is who I am.’ It’s now the right time. I am now very comfortable with who I am,’ he says. Born in 1964, Nguyen studied at Ho Chi Minh University of Fine Arts. He escaped from Vietnam in 1987. He spent six months in a refugee camp in Malaysia before coming to Australia in 1988 as a political refugee. He works as a graphic designer and an artist. He had his first solo exhibition in 2006 and has won various art prizes. This is his first time in the Archibald Prize.